Meeting Sarah last night for an espresso at the south side Italian Centre, allowed us a few minutes to walk around and scan the shelves. After talking about the gold foil covered extra virgin olive oil, we made out way over to the deli area and ran smack dab into a giant sign advertising the current Iberico Ham special. 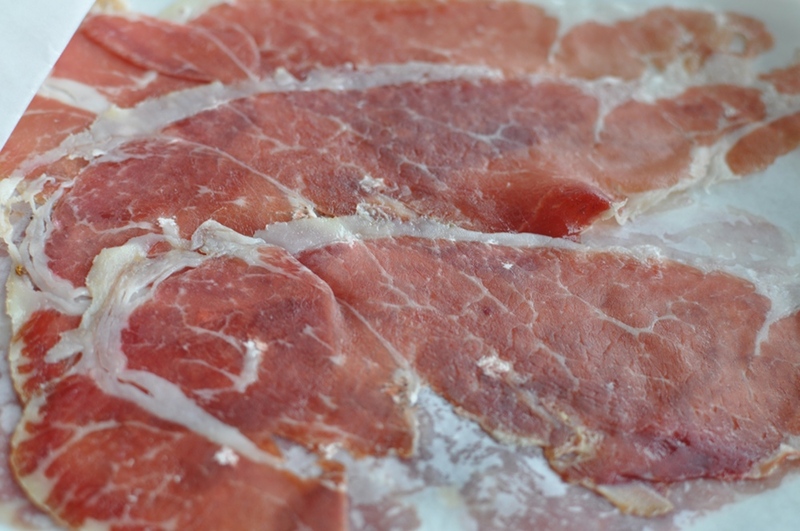 Along with the standard Serrano Ham, the Italian Centre is currently offering two aged cuts; 24 months and 36 months. Fulfilling my duty to you the trusty reader, I stepped up and placed my order. 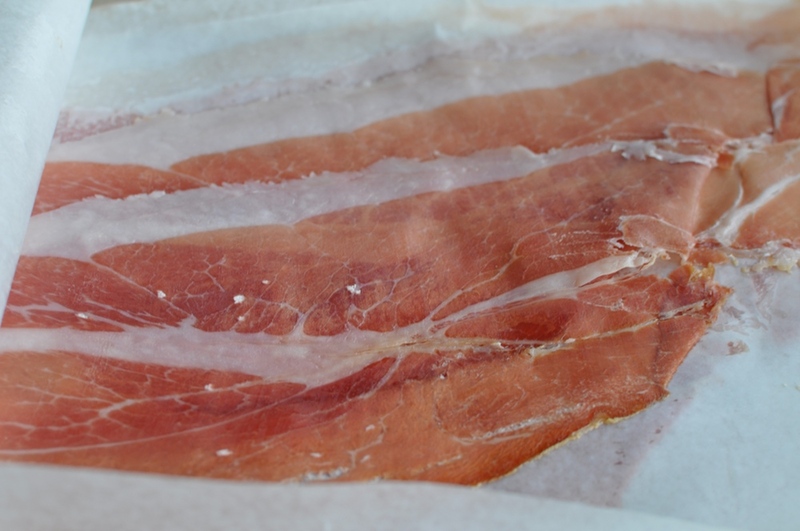 The third type of jamón ibérico is called jamón ibérico de pienso, or simply, jamón ibérico. 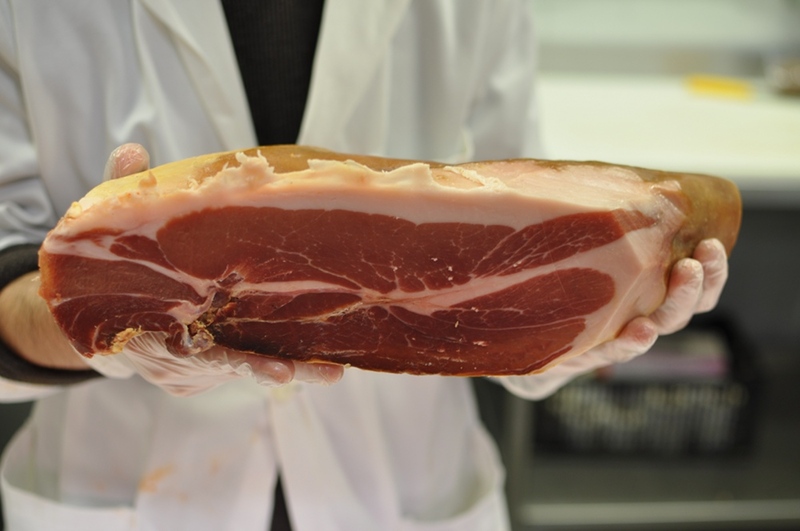 This ham is from pigs that are fed only grain. The ham is cured for 24 months. While I could be a little chapped that I wasn’t able to sample the middle, jamón ibérico de recebo, the high cost of this sample quickly kicked in as my tummy was in danger of pushing the bill towards $100. The saltiest of the bunch, all four tasters found this to offer the most bite. Definitely smoother than the first, this nicely marbled pig reminded some of a perfectly cooked ham. Stepping up in every category, this ham started to dissolve almost immediately in the mouth giving a few tasters a tough time describing the taste. The overall comparison was very interesting and proved that just like love, picking a favourite is in the mouth of the beholder. For myself, the well aged Jamón Ibérico de Bellota was the best; offering a butter like texture, it’s slow developing nutty flavour won me over. Of the three remaining tasters, each selected a different ham and stated proudly why it was so. I don’t know if I’ll be making sandwich out of these meats any time soon, but it’s nice to give yourself a bit of luxury every now any then. Did you have a favourite Valerie? Juat another reason why I need to keep looking for an escape hatch to Southern Europe this summer. Love your write up. Thanks H.Peter..wouldn’t we all love European escape hatch!